What's unique about the Share of the Farm program at Avalon Farms Homegrown? Variety...what’s a summer in Michigan without strawberries and sweet corn in season? Our greenhouses, high tunnels, market gardens and fields are planted with all kinds of good things to eat. What we don't grow ourselves we secure from other Michigan family farms and include them in the shares so you can enjoy more of what Michigan farmers grow. Choice...we let you choose the items and amounts you want each week. Now you can get the fresh veggies and fruit your family loves, and none that they don't. Pricing is $25 for 24 weeks picked-up at the farm. For pick-up at one of the Farmers Markets or Community pick-up locations a share is $30. Have your share delivered to your home or workplace for $35 per week. What are pick-up and delivery options? Choose from picking up at the farm, at the farmers markets we attend or at one of the community pick-up locations. Should you want your share delivered, we can do that for you. Visit https://www.harvie.farm/signup/avalon-farms-homegrown to see a map with all of our current options. I love to eat _____ (insert product) but I've run out of ideas of what to do with it. Any suggestions? Cook it. Bake it. Grill it. Freeze it. Can it. This is summer's abundance at it's best. Recipes, storage tips and directions for preparation are provided with the deliveries. How can you have tomatoes available in May? Ah, the glories of a greenhouse. Thanks to our greenhouses and high tunnels we can start growing earlier in the spring and harvest later in the fall. If everything works like it should, we are able pick hydroponic tomatoes from April through November. What are your growing practices? Are you certified organic? No two growing seasons are the same! Many factors impact what weed, insect or disease problems we have to deal with, including what crops we are growing. Some crops, and certain varieties of those crops, thrive in the heat, others prefer cooler temperatures. A cold, wet spring will create disease problems such as powdery mildew. A hot, dry summer will increase certain insect pest pressure. We do everything we can to avoid pest problems before a problem develops. But. Growing things means that we can't control all of the factors, including the weather. Best we can do is prepare. We use integrated pest management strategies (IPM) and tactics, like rotating crops to different fields or sections of the gardens to help avoid insect, disease and weed pest problems. When it comes to the greenhouses, controlling pest problems is different than in the gardens and fields. We can use lady beetles in the lettuce house to control aphids. 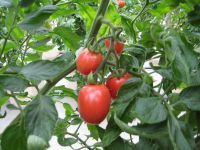 The two major insect pest problems in the tomato house are white fly and spider mite. We are able to use incarsea, a type of parasitic wasp, to control them. Since we pollinate with bumble bees we don't want to use any insecticides. As part of our IPM program weed, disease and insect pests are closely monitored so that we take action only if, and when, those pests start to negatively impact crop quality or production. We then use crop protectant products appropriate for the pest problem we're dealing with. Sometimes those products are labeled for use in Certified Organic systems when that is the product most effective, but organic products are not always available, and sometimes are not the most effective choice. Much of our produce is actually pesticide free. By scouting pest problems we can stay on top of problems so that we don't have to use insecticides, herbicides, or fungicides as all. A biodegradable film mulch is used to control weeds in rows. We love it since there's no plastic to pull in the fall and no plastic to dispose of either. We avoid tilling to control weed pests because we want to prevent soil compaction and soil erosion. Not tilling also conserves soil moisture. Our partnering farmers are also responsible growers and share our concern for producing a safe product for you, and protecting soil and water resources.